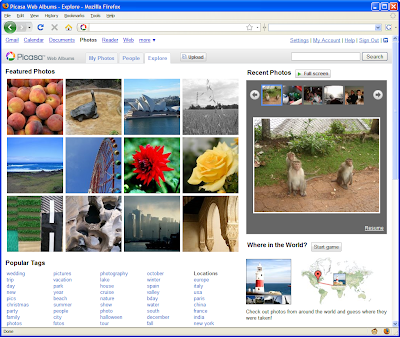 Have you ever wondered what types of snapshots are being shared on Picasa Web Albums by other users? Or have you ever felt like taking a break to browse through fascinating and beautiful photos from far away? Recent Photos - See the world through somebody else's camera lens -- our recent photos stream is a captivating, near-real-time view of public photos being uploaded to Picasa Web Albums. Because we're localized in 38 languages, if you check back at different times of the day, you'll see a different slice of culture from around the world! Featured Photos - View a selection of the most popular public images uploaded by fellow photographers. It's updated regularly, so check back often to see some of the best photos our site has to offer. Who knows, maybe your images will show up here one day! Where In The World? - Are you well-traveled or a good at figuring out little clues? Try your hand at guessing where various geo-tagged photos were taken...some of them might surprise you! We'll keep track of your high score so you can brag to your friends. Popular Tags - Just don't know what to type into that search box or just want to browse for interesting photos? Come see what images appear for some of our most popular tags. We hope these new features help you enjoy some of the great public photos on our site, interact with the users sharing them, and possibly pick up some new photography tips and tricks. Stay tuned as we add more widgets for you to explore content in the future.